Few can match the lifestyle of Alexander Wilson whose checkered career included weaver, peddler, poet, journalist, artist, engraver, schoolteacher, birdwatcher, and ornithologist among others. He is most famous for his work as an American ornithologist. 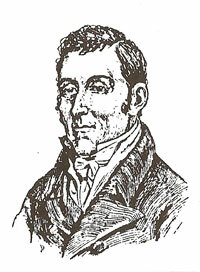 ■ Alexander Wilson was born in Paisley, Scotland on July 6, 1766. He was the son of a weaver and was apprenticed to a weaver but liked poetry better. He peddled wares to make a living, and his travels gave him material for his poems. ■ He wrote a narrative poem Watty and Meg which gained large circulation and helped earn him a reputation as a respectable minor Scottish bard. He lampooned some prominent people in his newspaper writings which were declared libelous and he was sent to jail. ■ On his release from jail, he decided to emigrate to the U.S. He arrived in Philadelphia in 1794 with only a few shillings in his pocket. He continued his travels, selling, teaching, and working at numerous jobs. ■ In 1802 he met an engraver-botanist who inspired him to learn botany, engraving, and sketching, especially drawings of birds. The result was a nine-volume work entitled American Ornithology started in 1808 and finished after his death in Philadelphia August 23, 1813. ■ Wilson roamed the American continent searching for material for his work. His reputation spread around the world, and he was honored by many of the world's scientific societies. ■ His disregard for his health in his quest for more information on birds brought on his premature death. He walked long distances with little food and shelter, pushing through almost impenetrable wilderness. ■ Wilson's American Ornithology became a classic and his legacy to the nation.